Parking at Woolly Mammoth is accessible, ample, and inexpensive. Enter the garage at 616 E Street NW: just to the right of the alley on the south side of E Street NW between 6th and 7th Streets NW (see map below). Take your ticket with you so you can get back into the garage. 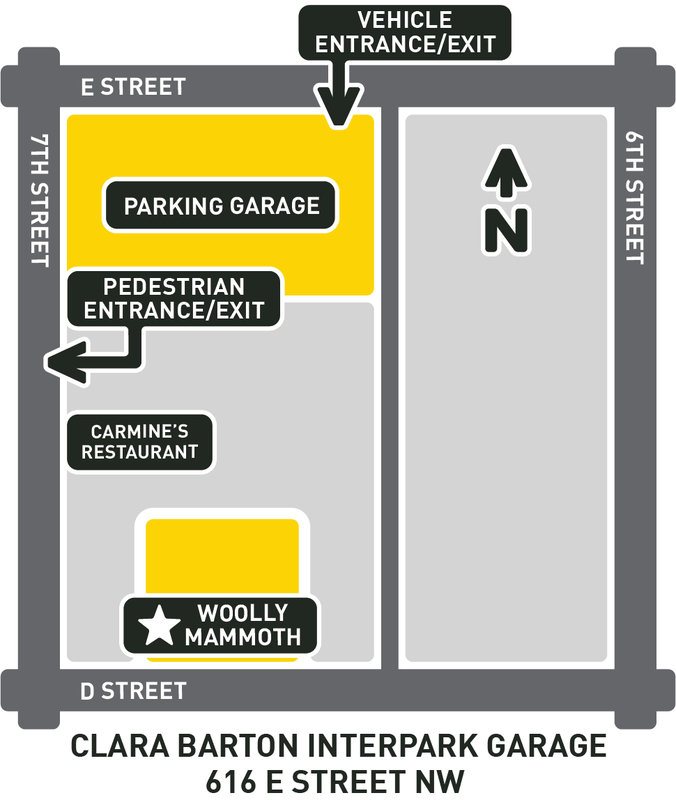 The pedestrian exit for the garage is located on 7th Street NW next to Carmine's restaurant. Turn left out the exit, then left at the next corner on D Street NW to find Woolly Mammoth. Ask our box office staff for a chaser card when you pick up your tickets for the show. After the show, return to the entrance next to Carmine's and use your ticket to re-enter the garage. Use both your ticket and your chaser card at the self-pay machines to reduce your parking cost to only $10. Woolly Mammoth is located in the bustling Penn Quarter neighborhood on D Street between Oyamel and Rasika restaurants.